The fall season is really settling in here. The hills around us are transforming from green to an array of orange, red, and yellow. Each day the colors seem to be slowly moving down the branches of the trees like wax dripping down a candlestick at a dinner party. It is one of my favorite times of the year. Every day the colors become more and more vibrant on our drives and walks around the area. 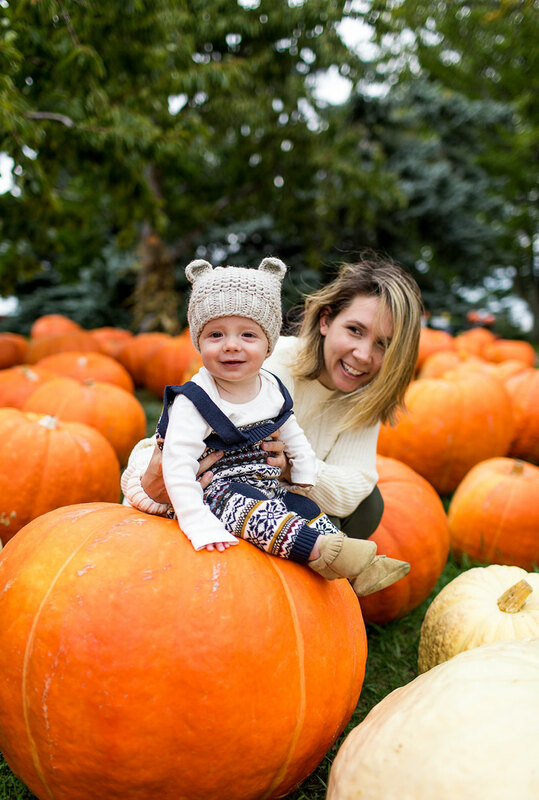 To embrace the beauty of this season, we took Hayes to his first pumpkin patch, and we were lucky enough to have Hanna Andersson join us on our trip. 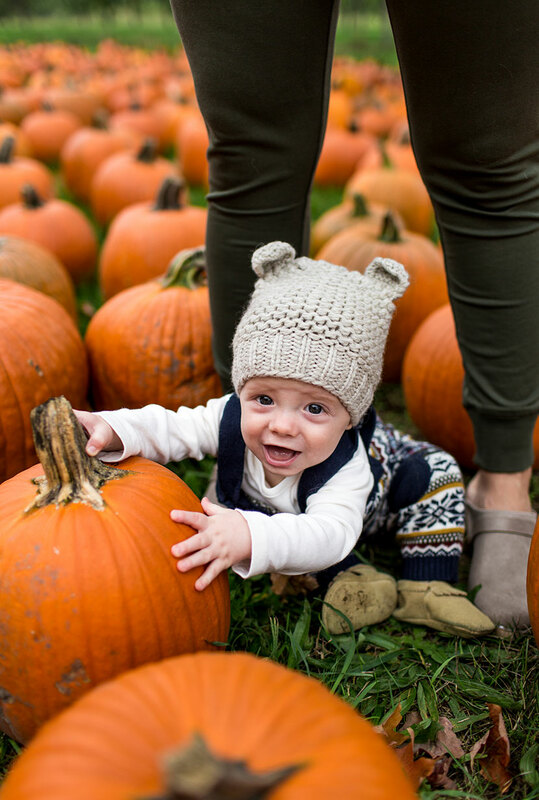 Hayes is a huge fan of anything related to being outside, the garden, dogs, squirrels, leaves, and now pumpkins. So when we started to see all of the pumpkin patches putting their signs out, we knew it would be a fun tradition to start. 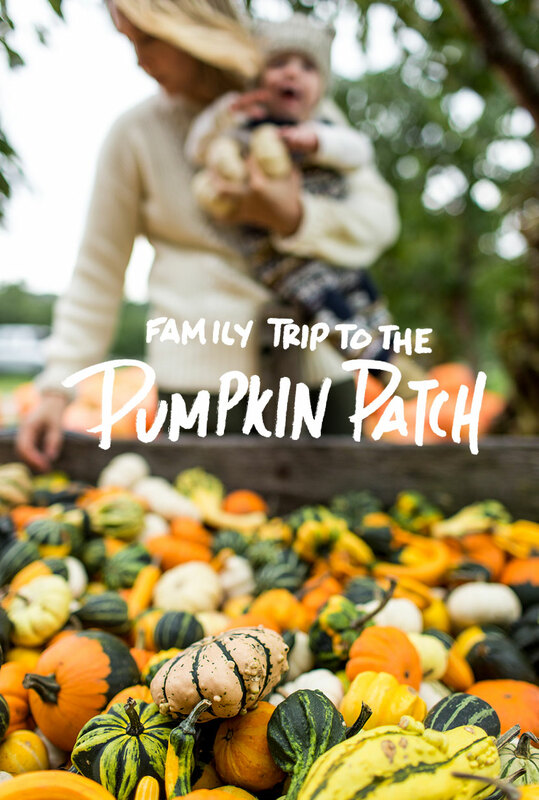 There are probably ten different pumpkin patches we drive past on a daily basis, so we just picked the cutest looking one and pulled in. I don’t know the name of it, but it is halfway up Old Mission Penninsula and has a wood sign with a pumpkin and an arrow pointing to the gravel drive. As soon as we stopped the truck he was wiggling to get out of my arms and check out the bright orange pumpkins all around us. 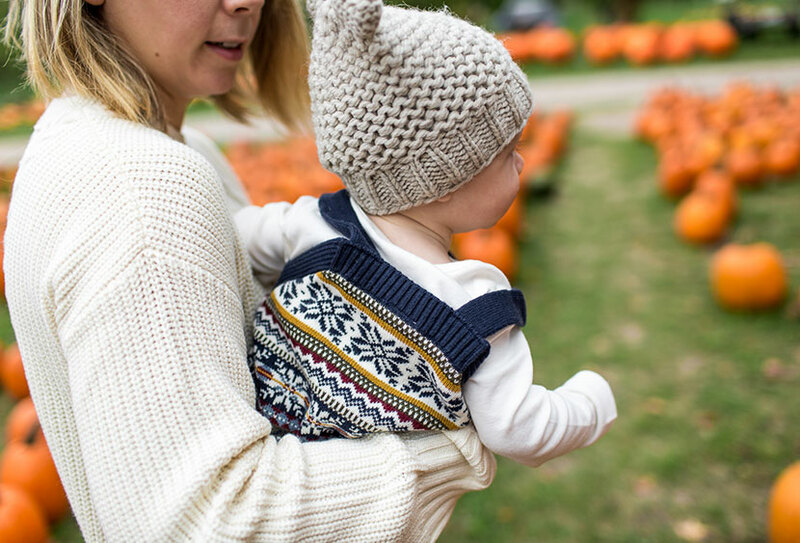 Hayes and I wore some really cozy sweater items from Hanna Andersson’s family collection. I remember my mom telling me that her favorite baby clothes for me, were from Hanna Andersson. The pieces she put me in as a baby had to be ordered by catalog and took much longer to arrive than they do today. Luckily for all of us, they have stores all over America and online now so we can have access to their amazing heirloom quality clothes. The company still keeps to the strict European standards of garment-making that they have always been known for since beginning in 1983. It makes sense when you feel the clothing because they simply feel different. 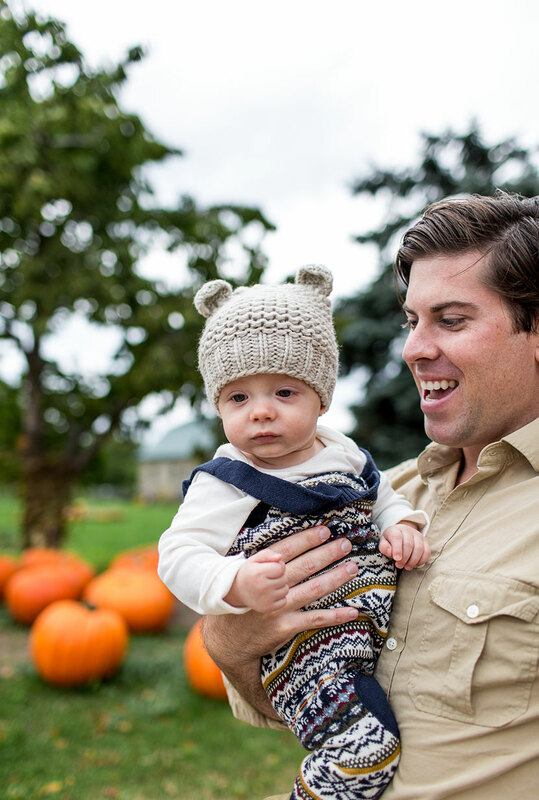 For instance, the cute little hat Hayes is wearing is actually handknitted with Peruvian wool yarns so it isn’t itchy but soft and cozy instead. 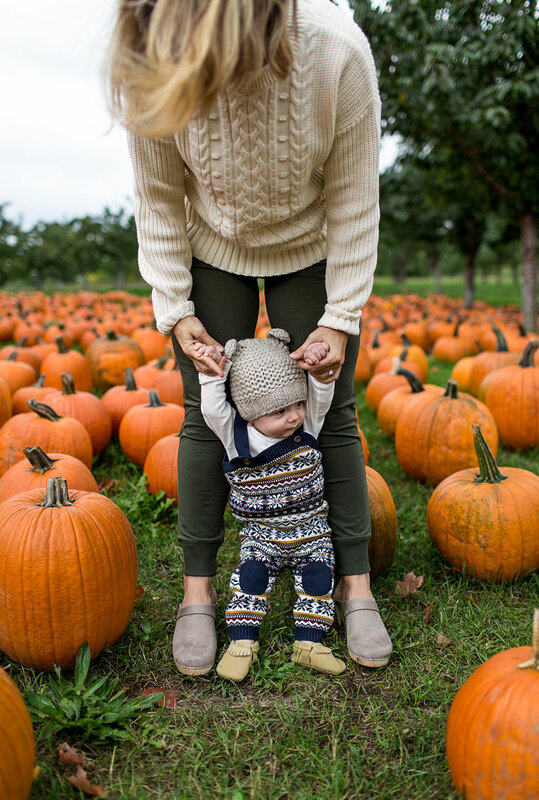 My mom and aunts still talk up and down about how much they loved the clothes they put us in from Hanna Andersson growing up, and I understand even better now that Hayes has a chance to enjoy the same quality and comfort of these items. 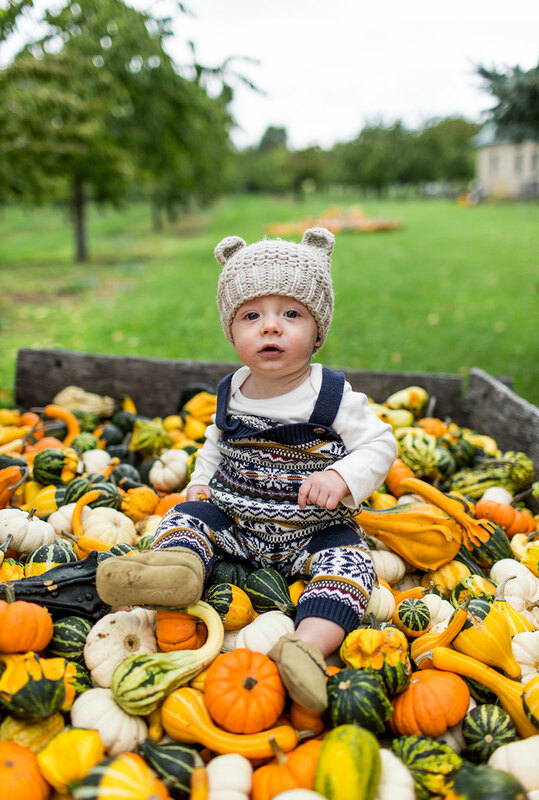 In the fall here it can be warm one day and cool the next so having clothes like these soft knits was great for our fall adventure to the pumpkin patch. One of the things I was most excited about when becoming a mom and parent was watching our children enjoy the seasons. Each season is magical in its own way, and there are so many unique things to do to help celebrate the beauty of each of them. 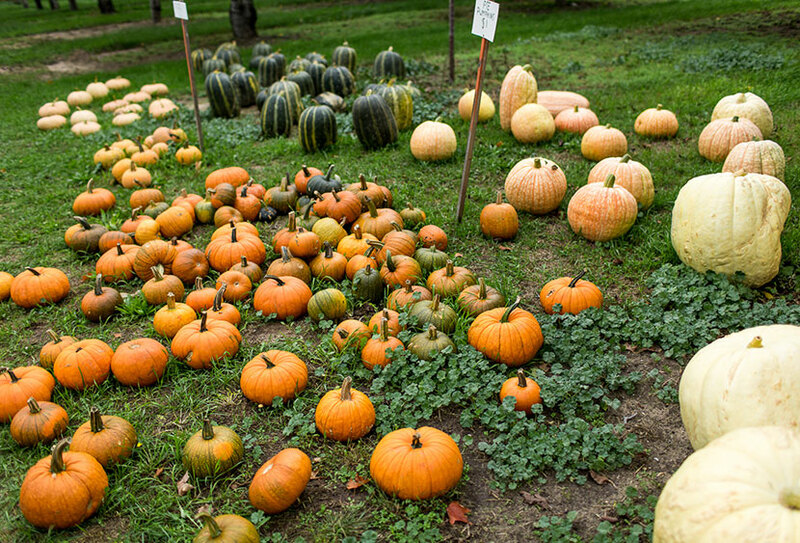 Creating traditions, such as going to pick out pumpkins in the fall or enjoying apple cider and pumpkin donuts one weekend are such unique traditions I remember fondly from my childhood. So, I couldn’t wait to start sharing these moments with Hayes as soon as we could. We tossed around for years before having kids what would these traditions be that would define our life as a family and shape the memories of our children. Now that life here is beginning to take shape, we are seeing what the right traditions may be for us. 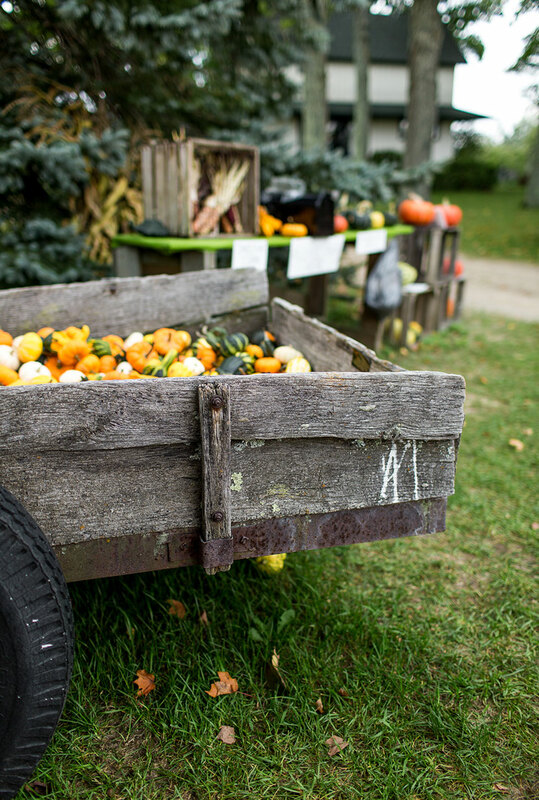 Since much of our life here in Michigan will be focused on seasonal living especially as we build our farm and home, we feel it is most natural and important to make the flavors and colors of each season an important part of our traditions. 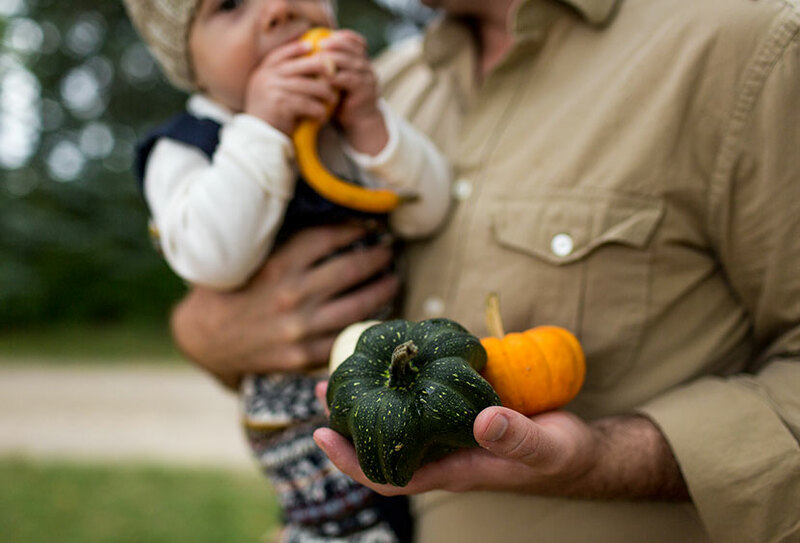 My hope is that each of our traditions can center around the foods available to us and the changing landscape around us. 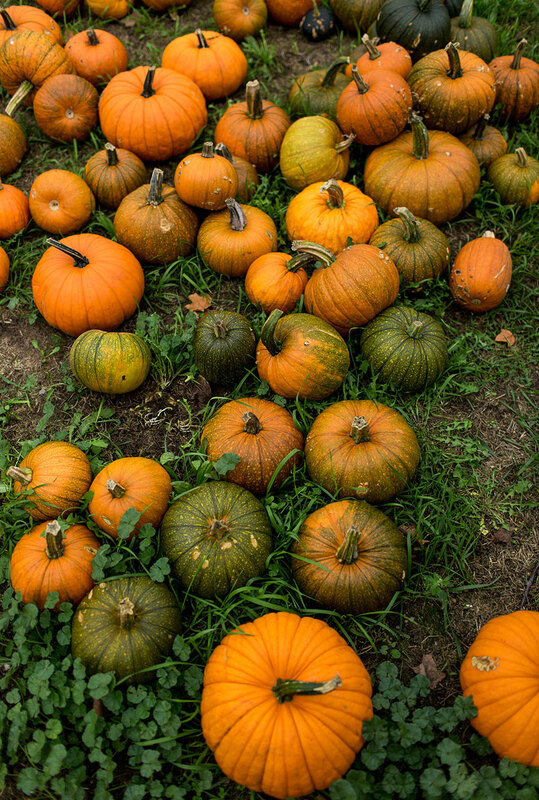 I always felt the tradition of picking pumpkins was the perfect celebration of the harvest in the fall, which is the most beautiful and bountiful celebration of the year. 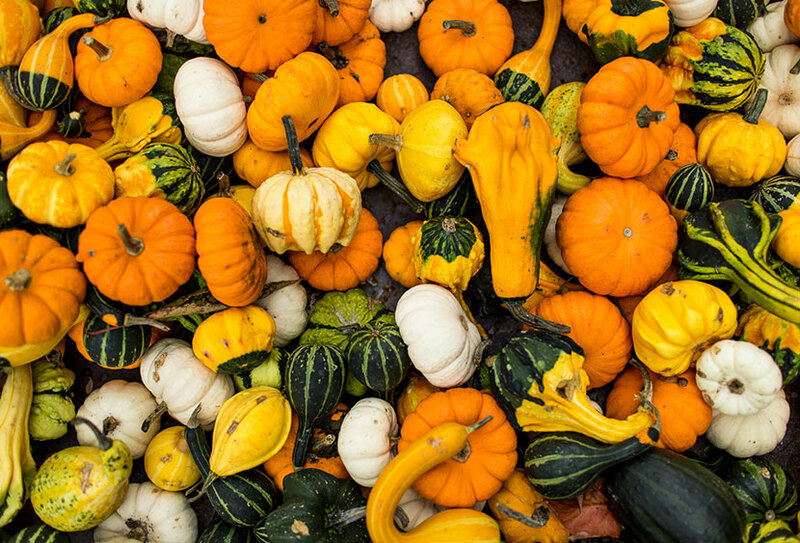 The last picking of the summer flavors and the ability to finally enjoy the squashes and fruits that have taken months to grow throughout the summer is such a treat! 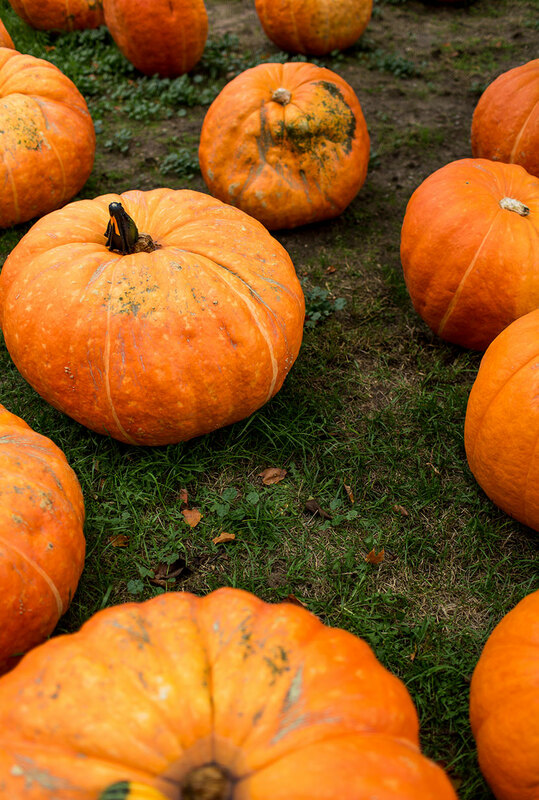 It is a special time to have a chance to be amongst the colors of the harvest and I always feel like pumpkins show those colors the best. 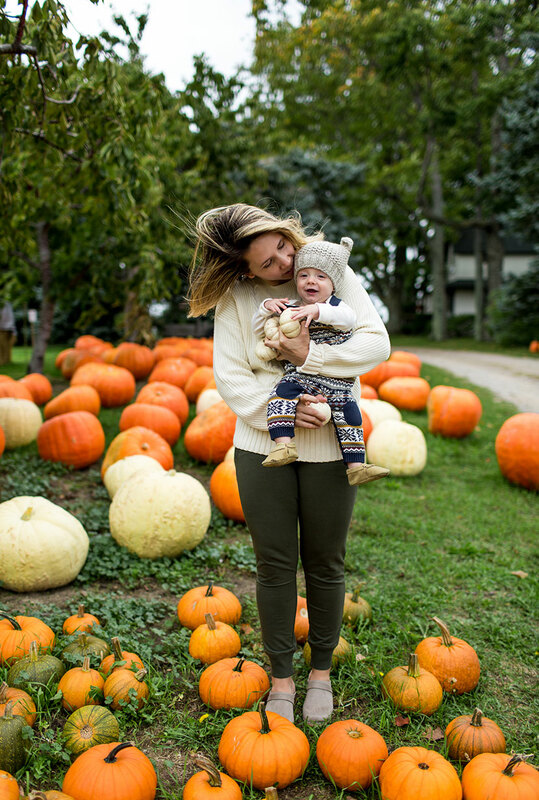 Though, this first time heading to the pumpkin patch together as a family may not be remembered by Hayes, we love that it is the beginning of the kinds of traditions we plan to have together. 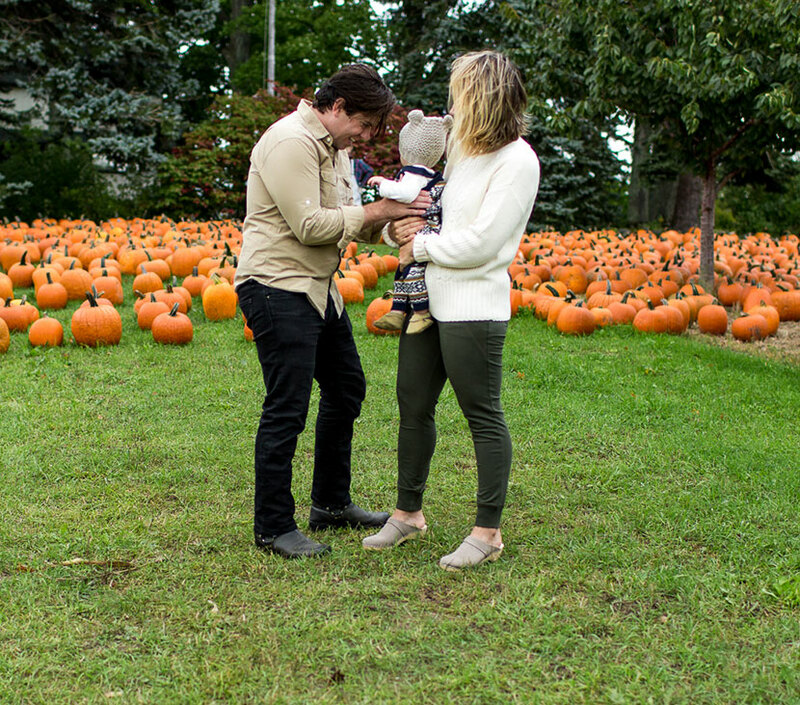 It is the beginning of many years to come of picking pumpkins together and that is so special to us. What traditions did you grow up with as a kid? What traditions do you currently have with your family? 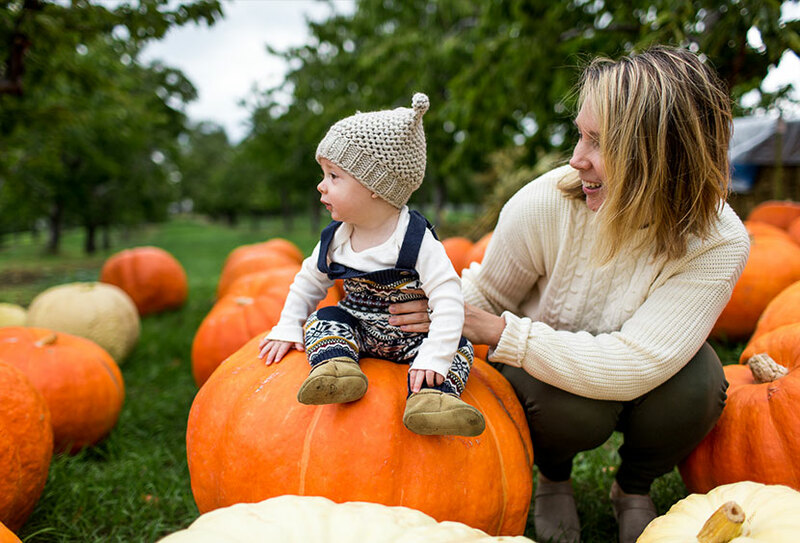 Or what traditions do you plan to have with your children in the fall? This post was sponsored by Hanna Andersson. All thoughts and opinions are our own. Thank you for supporting the brands that support The Fresh Exchange every month. oh my gosh his little outfit is the sweetest. 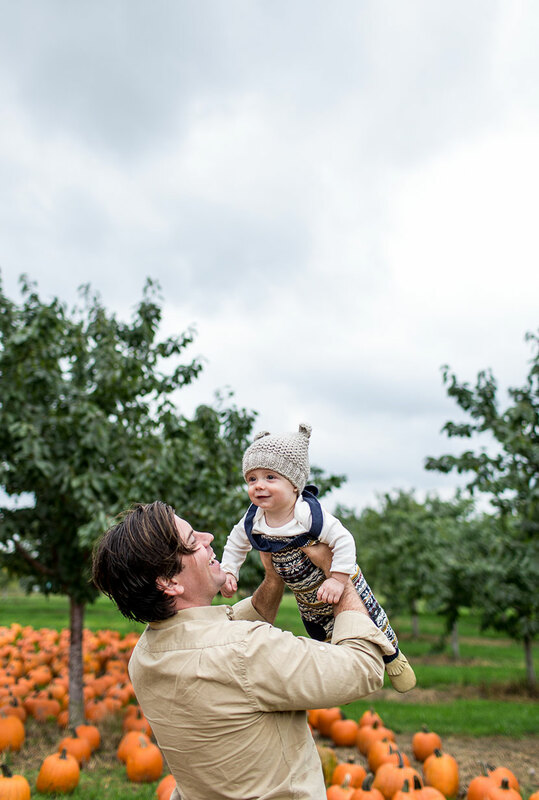 my littlest is just a couple months younger, i think, and we’ve been loving showing him the seasons here in ohio. my older ones didn’t get to experience that as babies since they are socal born. this season is just full of feelings for all of us and i can’t get enough! looks like y’all had a blast! Best autumn memory making right there! and you two look so adorable and cozy in your knits! 🙂 Love the little bear ears hat! Beautiful family! 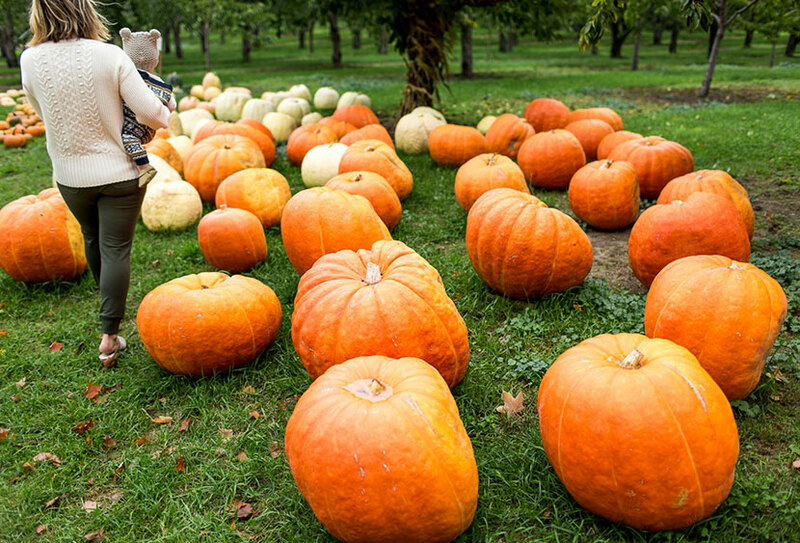 Some of my favorite fall memories from my childhood are at the pumpkin patch! Oh my WORD that is the cutest little outfit! 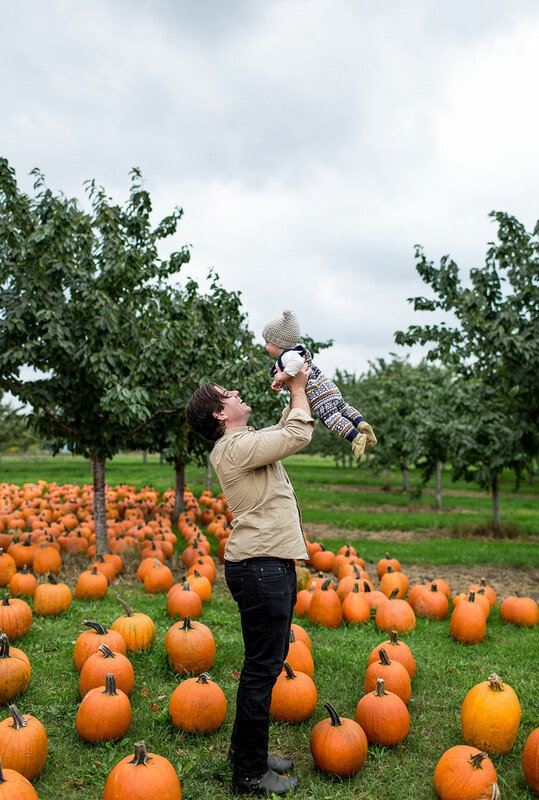 We didn’t really have traditions for autumn growing up, but when we were teenagers, my brother and I would go apple picking at an orchard close to our dad’s place. Growing in Upstate New York, apples were everywhere, and one year, my brother and I just decided to start really reaping the benefits of living close to orchards. 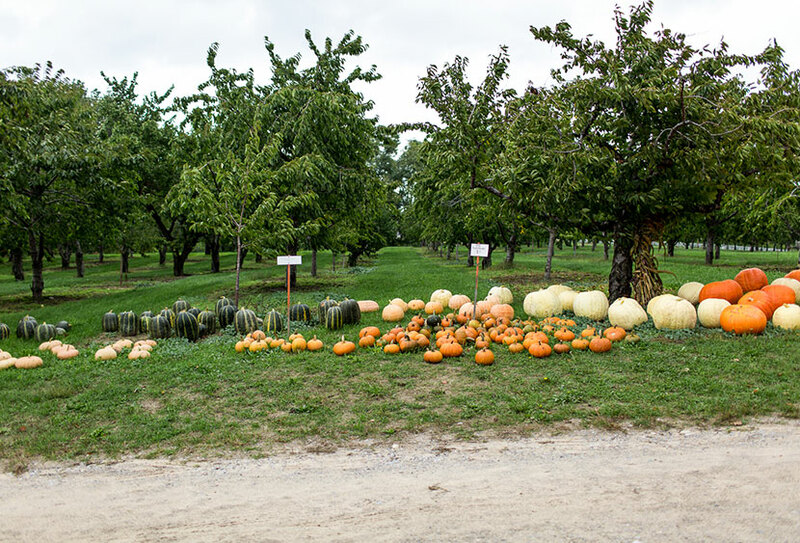 The orchard we always went to, Golden Harvest in Valatie, makes their own apple cider and apple cider doughnuts. Back then, ten dollars could get you a bushel-size bag, and that paid for the apples you put in the bag, the ones you stuffed in your pockets, and the ones you ate along the way. Then we would stop at the main shop, grab a pint and a gallon of cider each, as well as a dozen doughnuts. They always keep them in a warmer, so we would sit in the car after everything was said and done, drinking our pint of cider and eating a warm doughnut. It’s a tradition that was short-lived, as I moved away from my family in 2011, but I miss it dearly. I hope it’s something my husband and I can carry onwards as we build our life together. What Beautiful photographs! Thank you.